The fact that Survivor chooses to throw its castaways in the Caramoan islands further gives merit to the beauty of the place. And indeed, it’s beautiful! Island hopping is the best way to see the wonders of Caramoan. It’s the ideal barkada activity because there are plenty of choices to please everyone: beaches, sandbars, mountains... even visiting religious icons! It's got a petite cove where the sand is really fine. More photos here! Awesome rock formations. Lots of fish in the water, too! More photos here. My favorite for Day 1. It’s a big sand bar between two bodies of water! Fortunately, it was open! I guess there wasn't a Survivor challenge that day. More photos here! That's where the castaways of Survivor are currently at! Get your leg muscles ready! There are 568 steps going up. Don't forget the Php 15 entrance fee. A separate donation may be requested for the upkeep of the Church and Shrine. More photos here! but we ended up giving another hundred because he was nagging. Enjoy the view while resting. 568 steps is easier said that done. The statue seemed smaller than expected. If you're in Caramoan on the first Sunday of the month, you may want to catch the 8am mass here. My favorite for Day 2. Watch the sandbar get bigger and bigger! Beware of jellyfish! More photos here. We had to go to the island across for lunch. Where we had lunch! The food was c/o the hotel. There were vendors on paddle boats nearby selling coconuts at Php 15 each. This isn't a usual tourist destination. I thought we were there to see the carabaos! Bring slippers, put on extra sunblock, and get ready for an easy hike. Don't forget your swim stuff! More photos here. Some refer to these rocks as "Skyflakes" because of its wafer-like texture and shape. 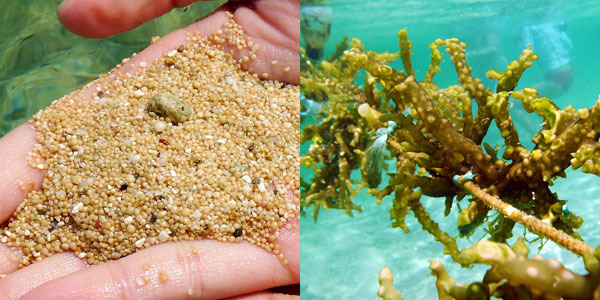 On the beach, you'll notice the bead-like sand (left) and certain type of seaweed being grown (right). Boats depart for island hopping in Bikal port. Travelers can start as early as 7am, and for safety reasons, should be back at the port before 5pm. Also, there are nearby sari-sari stores that sell alcohol if travelers want to have a few drinks while on the beach. Drink responsibly! Bikal port is where boats depart for island hopping. The cost of island hopping was included in our hotel package with Rex Tourist Inn. Pitogo, Catanhawan, Inayun-Ayunan, Matukad, and Lahos. I love this post and this has been a great help for a trip I am planning for some friends who are coming to the Philippines for a visit! thank you and keep travelogging! I'm glad this little post has been of help. I hope that you and your friends will have loads of fun in Caramoan!